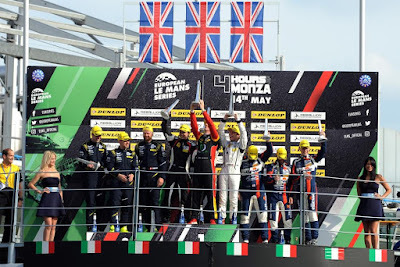 Oh, how great it was to watch both of the Aston Martin Racing V8 Vantage GTE's turn the tables to both come away with podium positions at yesterday's second round of the European Le Mans Series at Monza. Due to a negative change in the #99 Beechdean AMR and #90 TF Sports cars Balance of Performance, lap times for the cars didn't look good during the three Free Practice sessions and that continued into Qualifying as both cars struggled for top end speed along the circuits long straights. 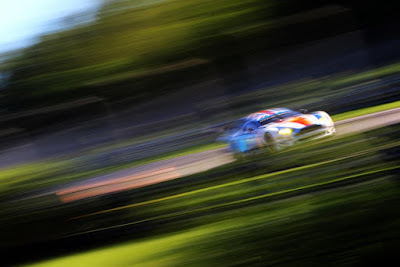 With the #90 TF Sport of Salih Yoluc starting P4 and the #99 Beechdean AMR car of Andrew Howard starting P7, any chance of salvaging a decent haul of points in Italy would depend upon all playing their parts to perfection within each of the teams plus some alliance on others to mess it up. Early gains looked promising as both Yoluc and Howard mirrored each others progress, swapping positions now and again as both cars struggled to keep in contention with those in front. The yo-yo effect as cars dived in and out of the pits during Full Course Yellow periods artificially inflated the AMR's positions only to be dropped back down again when things had balanced out - how disheartening that must have felt?! It was going to be a long day! By the end of the first hour of racing, Howard had already been replaced with their new young gun (as in Ross Gunn) with Euan Hankey having also taken over from Yoluc. For the Bronze drivers, they had done as much as they could have and it was then down to the Pro drivers to do theirs. Strategy calls could be seen being called up and down the pit lane as circumstance on track dictated, some would result in an immediate effect whilst others would be more long term and certainly Beechdean and TF Sport rolled the dice on a number of occasions. Half way point - and again the AMR's would pit for a full service and driver change with AMR works driver Nicki Thiim climbing aboard the #90 and Darren Turner aboard the #99 - their presence taking little time to take effect. After the demise of the long time race leading #55 Spirit of Race Ferrari, Thiim was already knocking at the back of the #50 Labre Corvette for P3 with Turner not far behind them and the #51 Ferrari. The disparage in performance between the Vantage and the Corvette was obvious along the pit straight but that clearly didn't hinder Thiim as he soon moved up to P2 behind the now leading #66 JMW Ferrari. The final hour of the race saw the #90 in second and the #99 in fourth, each about thirty seconds behind the car in front but with each much quicker than the car in front in the final dash to the flag. With about 30 mites remaining both AMR's were forced to pit for fuel and driver change - Hankey was back in the #90 and Gunn in the #99 with that team again saving lost time by only changing two tyres. After a monumental come back - Hankey was unfortunately unable to close the deficit of 10 seconds to Jody Fannin in the #66 JMW any further to finish P2 to the much adored yellow JMW car which was itself in its last ever race. 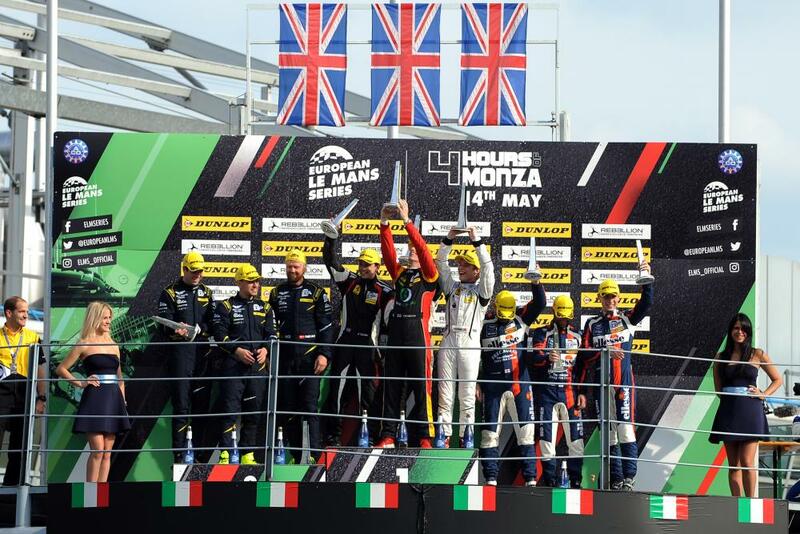 Backing up the stellar performance of the TF Sport team was Gunn, having taken the struggling #51 Ferrari for the final step of the podium in the Beechdean car. Great stuff. That result maintains the two teams podium run so far in the series with TF Sport leading the GTE field with Beechdean in P3 with four more events still to come. The Championship is certainly game on for both of them! Although not part of the European Le Mans series calendar, both teams now prepare themselves for the 24Hours of Le Mans in mid June with the Official LM24 test day two weeks beforehand as their respective 'prizes' for the deeds of last year. Obviously Turner and Thiim will be missing from their respective ELMS teams because of their factory WEC duties - their placed being taken by Olly Bryant in the #99 and Rob Bell in the #90.